We spent an entire year choosing our RV, and we learned a whole lot about how to pick the right RV in the process. In this post, I share what we learned. We hope that this post will help you in your search for the right RV. Think through your needs carefully. Different RVs will suit different needs. For example, an RV for a family of four planning to live in an RV full time will look very different from an RV for a couple planning to spend three weeks a year in an RV. Our experience illustrates the point. 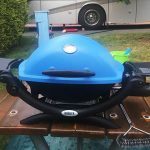 When we first decided we wanted to start RVing, we had no idea what kind of RV we would buy. And initially, we did not give a whole lot of thought to what we would need. So one day, when Maggie sent me a link to a video about the Safari Condo Alto, I was immediately ready to believe that this tiny teardrop trailer was THE ONE! The Safari Condo Alto, a teardrop trailer that has a roof that folds down to make it even more tiny! We watched a bunch of YouTube videos about this premium RV made out of aircraft quality aluminum, and became convinced that this was the perfect RV for us. Best of all, as it weighs only about 1,800 pounds, we could probably tow this tiny trailer with the Mazda that we already owned! Left: the vehicle we THOUGHT we might be able to use to tow. Right: the tow vehicle we ACTUALLY ended up with! 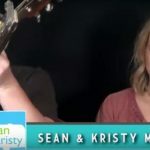 Somehow, we never really noticed that the videos mainly featured single people, and mainly people who were really tiny (like 90 pounds, soaking wet – an accusation that could never be leveled against either of us). Also, they were cheerful all the time! We certainly aim to be cheerful, but personally, I can be cranky at times, and sometimes I yell at computers. Add in my giant Mac computer, my cameras, two laptops (all needed for our blogging business), two small but active and demanding dogs … and you have a family that needs some SPACE! However, because we had not stopped to consider out real needs, we were so sold on the idea of the Safari Condo Alto that we seriously considered putting a deposit down on one of these very well-made trailers. They are not production line, so you have to wait up to two years to be the proud owner of a new one. Fortunately, there was a dealership near us that had a couple of Safari Condos on the lot, so we took a drive out to see them. Very excited, we climbed inside, fully prepared to be wowed. Well, the finishes were stellar, and the craftmanship was impressive. No doubt about that. But then we sat down and really thought about spending serious time in this tiny space. Not only was it really tiny, but the “washroom” offered almost zero privacy. I got to thinking about what it would be like if one of us had stomach flu. Would it be worse for the sick person, or for the involuntary witness? Not exactly a recipe for a long and happy marriage. I still shudder when I think about it. All in all, after we physically experienced the Safari Condo Alto, we were a hundred percent clear that it was not the RV for us. There was just no way both of us, plus two small dogs, could be happy together in that tiny space. For example, go to a variety of dealerships, and attend as many RV trade shows as you can. The goal is to spend a lot of time in various kinds of RVs, so you can realistically assess which one would be right for you. So, we looked at a few 18 to 21-foot trailers. We refused to look at anything that had any slides (too much weight!) Again, we went through the process of spending a lot of time physically inside those trailers, carefully inspecting them, and thinking what it would be like to spend time in them. Maggie especially did a lot of examining, checking, and measuring. We could have gone one step further and actually rented a small trailer for a week, which is good advice we read somewhere. However, that was not practical for us, so we made do with engaging our imaginations. 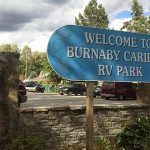 Luckily, we were able to go to some RV trade shows and take a good look at what was on offer. It took just a few weeks to get to the point where we realized that these tiny trailers were going to be too small. For example, I was repelled by the thought of sleeping right next to a stove (which is quite a common floor plan in tiny trailers). We could not find a single floor plan that seemed to be just right. Next, we started looking at 24-foot trailers. We still refused to consider slides (boy, were we stubborn!). With these, we finally found a trailer we really loved. It was a Passport Ultra-Lite 34QBWE. And it was on sale! But the real selling point for us was that it had a lot of windows at the back. We imagined being parked at an ocean or a lake, enjoying the view from that window. Yep, that could work, we thought. Tip #3 for Choosing the Right RV: Don’t Rush It! You are going to have your RV for many years, and you don’t want to live with a mistake. We nearly made a mistake with that Passport Ultra-Lite, just because we liked it so much. Luckily for us, the time was not right financially for us to purchase our RV. So we were saved from ourselves! Spend some time examining every inch of it, and also just sitting and imagining yourself being in it for extended periods. We spent a lot of time doing that. To be honest, we just wanted to jump in and buy that Passport Ultra-Lite with its attractive sale price! Thank goodness it was simply not possible. This will give you the chance to learn from their experience. 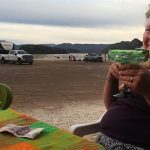 Speaking to an expert at a trade show completely changed our choice of RV, and ultimately, changed our lives. We didn’t just take the instructor’s word for it. After all, he only had 30 years’ experience, compared to our zero experience, so what did he know? Instead, we asked Google. Unfortunately, Google agreed with him completely – apparently fifth wheels are much easier to tow. With our plans to cross the North American continent, all of the experts seemed to agree that we needed to make that towing experience as stress-free as possible – and to achieve that, we needed to think fifth wheel. So, there we were … back to the drawing board. 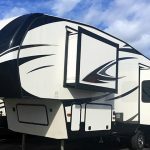 Attending yet more shows, this time to look at fifth wheels and realistically compare them to the 24-foot travel trailer we had set our hearts on. We found this Grand Design Reflection 230 RI at an RV show, and were pretty sure it was the one! From that point, it did not take too long to find the right RV for us. We almost immediately realized that we could live far more comfortably in a fifth wheel than in a 24-foot trailer. Then we found a fifth wheel that seemed to be just perfect for us, a Grand Design Reflection 230 RI. We sat in at a show it for hours, and ended up speaking to several people who had previously owned fifth wheels. We became convinced that the 31-foot Grand Design was for us. 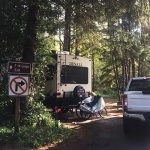 It was the smallest fifth wheel we could find, because we were still convinced that we wanted to tow as little length and weight as possible. However, it did have two slides. By now, months into the choosing process, we were starting to really appreciate the value of space, versatility, and a good floor plan. With the result, that we had finally got over our slide phobia! Because if you choose the wrong RV, you may feel you have no choice but to trade it in after a year – which will cause a major financial loss. The only things that lose value faster than cars after you drive them off the lot, are RVs. We wanted to be certain we had looked at every possibility, so even after we had made out choice, we decided to go to one more dealership – one we had quite enjoyed the first time we went there. We showed the salesman the floor plan of the Grand Design Reflection 230 RI we had picked out, and asked if he had anything comparable on the lot. He studied the floor plan and then took us out to look at a Denali RDS257. 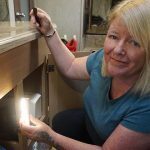 Well, the deal was basically sealed the moment Maggie saw that this RV had everything the Grand Design had – AND it had a kitchen island! It was love at first sight! I did not really get the big deal about the kitchen island, and instead was a little fixated on the fact that the Denali did not have reclining armchairs. How was I going to live without a recliner? However, happy wife, happy life … so we finally committed to that Denali. Once Maggie saw the kitchen island in the Denali RDS257, the deal was pretty much sealed! In our case, we are so grateful that we looked a little further, and ended up moving on from the Grand Design to the Denali. For one thing, that island has turned out to be really important. I know, it seems odd. But details are important. The island separates our kitchen from our living space, giving us far more options and variety. And we have overcome the lack of recliners by using a comfy ottoman to rest our feet on. Plus, the Denali has a few features that make us happy, such as a built-in vacuum cleaner that makes clean-up a cinch. And the Denali has three slides: kitchen, living room, and wardrobe, which together give us more than enough space. After all those months, we finally ended up with an RV that suits our needs. It is a lot larger than we originally planned. But we did at least manage to buy the second-shortest fifth wheel available (31 feet). And once you consider that 4 feet of that rests over the truck bed, that means that our rig is only just a little longer than it would have been if we had gone with the 24-foot trailer. But wow, we have so much more space in this fifth wheel than we would have had in that trailer that we once thought was so perfect! All in all, this process took us about a year, and many, many hours of research. We changed our minds several times along the way. Which we like to think of as being flexible, rather than being fickle. It was not so much a purchase as a process that we had to go through. A process in which we were forced to think carefully about who we are and what we need. But at the end of it all, we are certain that we chose the right RV for our needs. Good luck with finding just the right RV for you!